Led by the 5-foot-7 Norwegian, the Rangers battled hard and came away with a 2-1 win, their second straight victory and Toronto’s fifth straight loss. In his return, after a six day break, Henrik Lundqvist improved his record to 5-2-2 last night as the Rangers gained two more points to keep them at the top of the Metropolitan Division standings. They are now 7-2-2 (16 points) in their first eleven starts this season. Alain Vigneault decided to reunite some trusted line combinations by switching centers Brassard and Stepan. Vigneault also mentioned that while Zuccarello has gotten off to his best start ever, he expects more from him. These small critiques were made in the hopes of better offense, although the Rangers haven’t seemed to have a problem with that as of late. The Rangers were guilty of giving up quite a few odd man rushes to the Maple Leafs. However, excellent defensive play kept the game scoreless early in the first. The Blueshirts got the first four shots on net, but the Leafs caught up a bit to end the period with six shots to the Rangers’ nine. Well, Zuccarello, as always, accepted his coach’s challenge, notching his fifth goal of the season 9:41 into the first period. Give credit to Nash and Brassard, though, who both received assists with beautiful passing jobs. Rick Nash gained the blue line, and the puck found its way to Brassard. Without hesitation, Brassard gave a fast pass to Zuccarello who caught Bernier off guard when he pulled the trigger on a hard shot to put his team up 1-0. 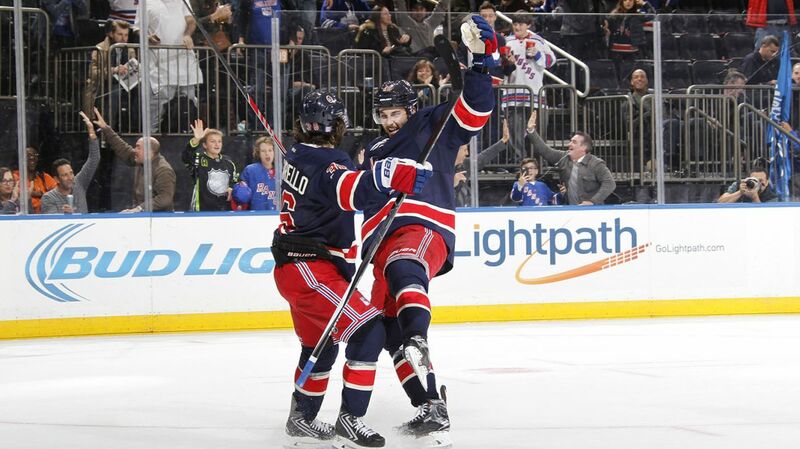 Mats Zuccarello and Derick Brassard celebrate. Photo courtesy of MSG Photos. While Rick Nash gets his criticism for not scoring as much as coaches and fans are used to, he deserves applause for his great puck possession. Rangers’ announcer Joe Micheletti stated “Rick Nash has been all over the puck in this first period”, and he was right. Besides ending the night with three assists, he is a dependable two-way player with a lot to offer. And with his strong play, the scoring will come. Just trust that. A key point throughout the game was the stellar performance of the Rangers’ defense, not to mention their contributions to offense. This is strongly evidenced by players such as Girardi and Klein going in deep to make their presence known. Just two minutes into the second period, a careless play by Stepan allowed for a two on one for the Leafs. Clune got the shot, but failed to capitalize on it, and the game remained tied. The Rangers said before the game that special teams would come in to focus in this particular matchup. They had two consecutive power play opportunities, not getting a shot off on the first one. The second opportunity saw only one shot. This poor production is partly because of over passing the puck instead of just taking the shot. Their third power play of the game was better, but it still wasn’t enough. Hayes had a chance but misinterpreted the play, performing a spin-o-rama into open ice right near Bernier. This is definitely an area AV will want to improve on. Kevin Hayes had a chance in front on the PP, but could not slot it home. Photo courtesy of MSG Photos. However, the Blueshirts did not go on the penalty kill last night, and they remain perfect in their last 17 times shorthanded. Inside the final minute of the second period, the Rangers made a final push, taking momentum off of Rick Nash’s great shift, but the period ended with the Rangers still up by a goal. With Stalberg still out after sustaining a head injury, Emerson Etem filled his position nicely. He was credited with 13:16 TOI and three hits. In his interview during intermission, he commented that he intends to make an impression and do as much as he can to help his team. And let’s not forget Dan Girardi, who besides having high hockey IQ, is also very good at keeping the puck in the zone. He was credited with a game-high four hits. The third period started pretty dramatically as the Leafs put the puck behind Lundqvist just 12 seconds into the period, thinking they had the game equalizer. The referees thought differently, though. Babcock put up a coach’s challenge on the play, but the Rangers caught a break. The refs remained steadfast in their decision of no goal, and play went on. If you thought Zuccarello was finished impressing for the night, you though wrong. Just 5:34 into the third period, Zucc proved himself yet again, putting the Blueshirts up by a pair. But he didn’t do it alone. Who else but Nash and Brassard to help him out…again? They each got their fourth assists of the season while number 36 in blue got his sixth goal of the season, taking the team lead. It is also his ninth career two-goal game. Mats Zuccarello scored his second goal of the night on another pretty passing play. Photo courtesy of MSG Photos. After pulling Bernier with just about 2 minutes and 30 seconds left, Lupul’s tip-in gave the Leafs some life, as they were only down by 1 goal. To finish off an incredible night, the terrific trio of Nash, Brassard, and Zuccarello struck again. Zuccarello received his first career hat trick scoring an empty net goal with just seconds remaining in the game. The hats poured out onto The Garden’s ice, and the fans went wild for one of their favorite players. Lundqvist finished the night with 24 saves and improving his GAA to 1.87 and his save percentage to .943. The Rangers have now won two straight as they continue their home-stand against the Capitals on Tuesday night. It’s a rematch of the intense, hard fought Eastern Conference Semifinals from last year, and the Capitals have been really good. So expect a lot of action. Catch it at 7:00pm on MSG. Posted on October 31, 2015, in Game Recaps and tagged Alain Vigneault, Chris Kreider, Dan Boyle, Dan Girardi, Derek Stepan, Derick Brassard, Dion Phaneuf, Dominic Moore, Dylan McIlrath, Emerson Etem, Jarret Stoll, Jesper Fast, JT Miller, JVR, Keith Yandle, Kevin Hayes, Kevin Klein, Marc Staal, Mats Zuccarello, MSG, Nazem Kadri, New York Rangers, New York Rangers blog, NHL, NYR, Oscar Lindberg, Rangers, Rangers blog, Rick Nash, Ryan McDonagh, Toronto Maple LEafs, Viktor Stalberg. Bookmark the permalink. Leave a comment.